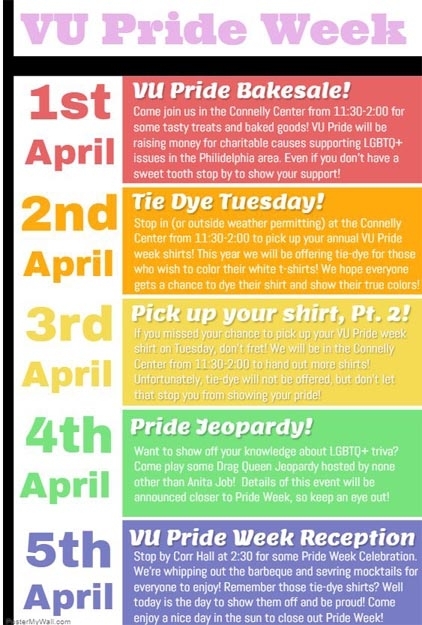 Did you know that VU Pride Week is next week? Be sure to check out the list of events (below) and take a look at this weekend’s recommendations. I decided to highlight queer narratives and LGBTQA-centered media. Enjoy, and Happy Pride! Listen to this fairly recent TED Talk about the centuries-old history of the trans community. Check out Falvey’s copy of Basically Queer, an introductory book to the LGBTQA community. It offers explanations, definitions, and information regarding sexuality and gender identity, as well as a succinct account of queer history. Peruse LGBTQA-centered media platforms, such as GLAAD, them, and ADVOCATE, to read news and articles not featured on mainstream media outlets. Listen to Janet Mock’s podcast, Never Before. In it, Mock, a transgender woman and well-known advocate for the queer community, interviews well-known celebrities, writers, fashion designers, and more.